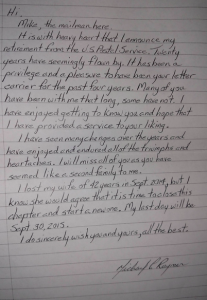 Last week I heard about a touching story of a mail carrier in Glendale, AZ who left his customers handwritten notes (one of them is shown here) informing them that he was retiring at the end of the month and telling them how much he enjoyed getting to know them over the years. Today is Labor Day and I thought it would be fitting to drop you a note – you’ve certainly worked hard throughout your career and deserve a day off. Thank you for both your military and civil service to our country. 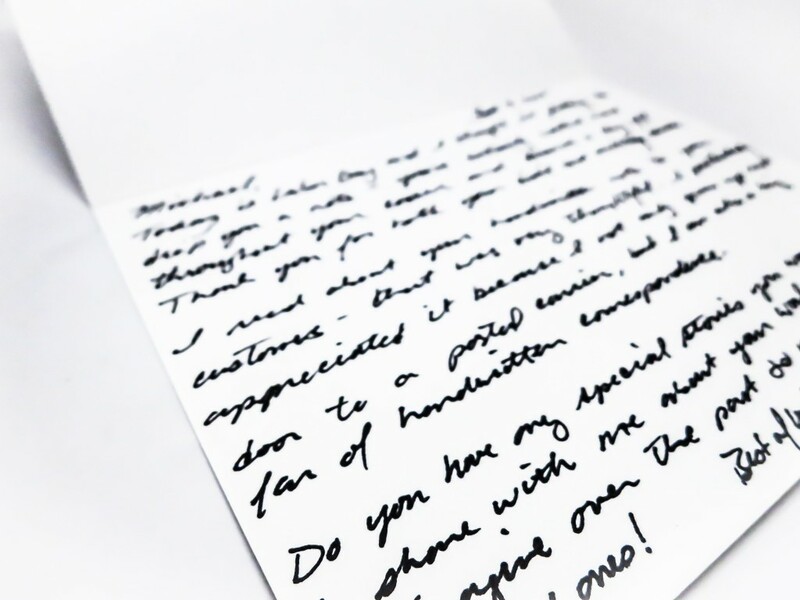 I read about your handwritten note to your mail customers – that was very thoughtful. 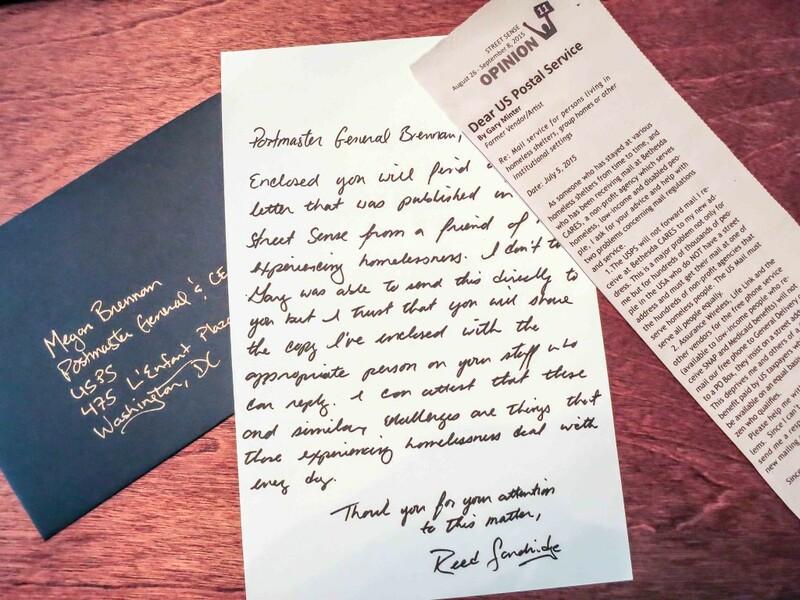 I particularly appreciated it because not only did I grow up next door to a postal carrier, but I also am a big fan of handwritten correspondence. 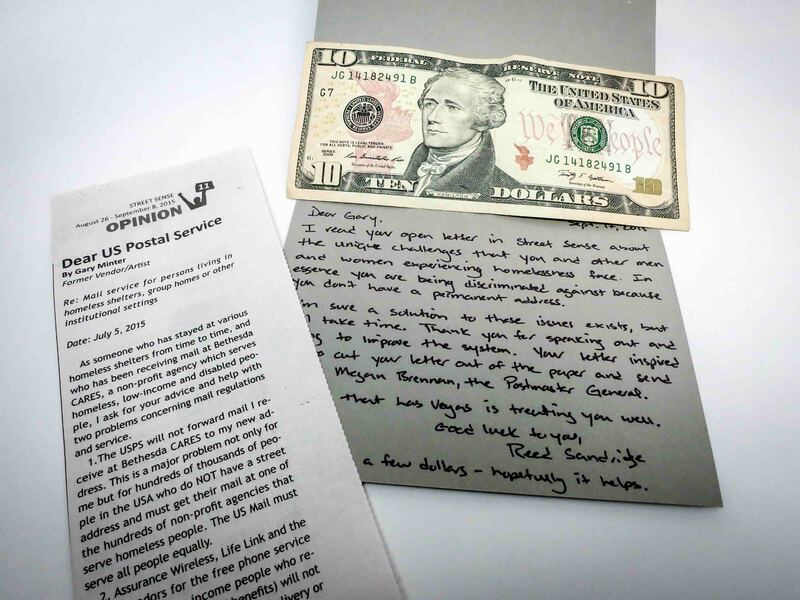 Do you have any special stories you would be willing to share about your work as a mail carrier. I imagine over the past 20 yrs you must have had some good ones! 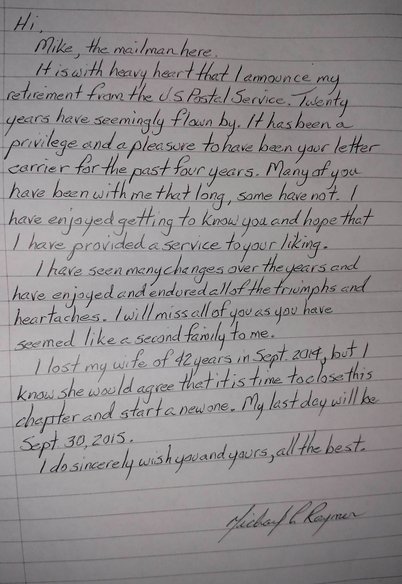 Best of luck in your retirement! This past week I received two handwritten letters. One of them from Michelle who I wrote to on Day 58 and the other one from Myra who I will write this week – maybe tomorrow! Most of the time we think of handwritten letters in a very positive light. They often unfold people’s true feelings of happiness, love and admiration. 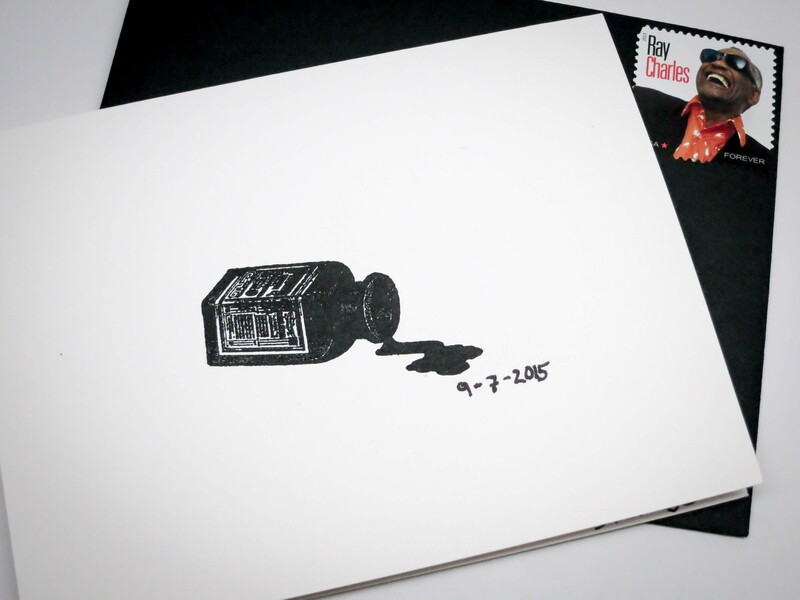 But not all handwritten letters are so pleasant. 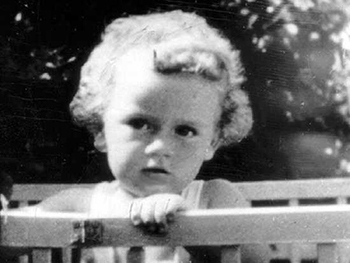 Eighty-three years ago today a crime was committed in Hopewell, NJ that would be dubbed “the crime of the century.” Sometime between 8-10pm on Tuesday, March 1st, 1932, the twenty-month-old son of famed pilot Charles Lindbergh was kidnapped from the family home. The cute dimpled boy with curly blond hair and striking blue eyes vanished out of the Lindbergh’s second story home. anyding public or for notify the Police The child is in gut care. Singnature (Symbol to right) and three hohls. 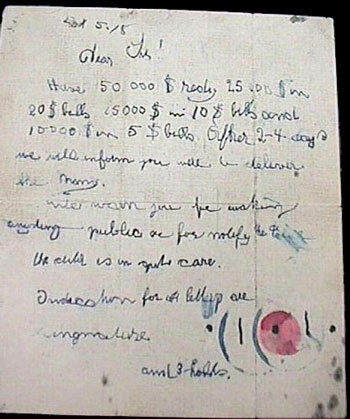 Ransom notes were issued and the Lindberghs paid $50,000 in marked currency. 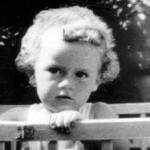 Sadly Little Charles A. Lindbergh Jr. was not returned to his family and was found dead six weeks later on a roadside by a passing truck driver. Police did arrest a man, Bruno Hauptmann, who was convicted and later electrocuted in Trenton State Prison on April 3, 1936. Most people know Charles Lindberg Sr. for his historic solo nonstop transatlantic flight. But before making history, Lindbergh was a U.S. Mail pilot, carrying handwritten letters in his planes across the midwest. 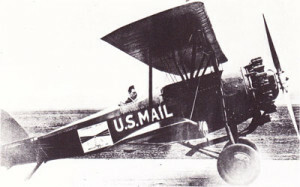 I read that he bailed out twice from his mail plane and parachuted to safety only to land and immediately go to locate the wreckage in order to save the letters that were onboard. “Neither snow nor rain nor heat nor gloom of night stays these couriers from the swift completion of their appointed rounds.” – Maybe they ought to add plane crashes to that list!